It is often said by cynical economists and political commentators, usually of the right or libertarian persuasion, that the road to hell is paved with good intentions. There is no more odious and damagingeconomic policy that comes from the heart than rent control. For years, limiting the cost of living spaces was done at the local level, but one West Coast state aims to be the first to implement statewide rent controls. 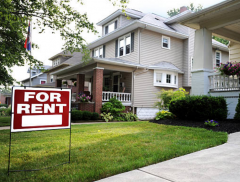 Oregon is set to pass SB 608, legislation that prohibits landlords from raising rents in the first year of a resident’s tenancy. The bill would also cap future rent hikes at 7% annually, plus inflation. This will target all rental properties 15 years or older but exempt units that are a part of a government housing project. It should be noted that SB 608 does not have vacancy controls, which means buildings can jack up the rent by any amount once the tenant gives his or her notice. Because of this, the legislation bans no-cause evictions, so any landlord must offer a government-approved excuse for evicting a tenant. With Democratic supermajorities in both chambers of the legislature, SB 608 is likely to pass, making Oregon the first state with statewide rent control. First, it is important to examine the justification for rent controls. Advocates contend that it is immoral for someone who has lived in a neighborhood his entire life to be suddenly priced out of it. It is also wrong, they assert, that landlords are just sitting on their rear ends, enjoying higher rents, because there is a greater demand to reside in New York, San Francisco, or Boston than in Jerome, AZ, or Bonanza, CO. Proponents will ignore the unintended consequences of rent control. New properties are not erected, vacancy rates plunge, existing landlords exit the market, and the small supply of housing diminishes. Landlords will try to evade regulations by transforming their units into condominiums, luxury apartments, furnished suites, or offices. Advocates also overlook two other important facts: Real estate can be utilized for a diverse array of purposes (commercial, housing, or industrial), and these laws distort pricing signals. Ultimately, the state plays a game of cat-and-mouse, coming up with intrusive ways to rein in the evaders. Regulation begets regulation. When World War II ended and peacetime reigned supreme in America again, things were not what they used to be, at least for the thousands of troops returning home. After being engaged in battles overseas, soldiers had a new front to fight at home: life – and everything it had to offer. Despite the inflation rate either contracting or rising in single digits between 1947 and 1952, the cost of living ballooned for the returning heroes of the Armed Forces. One area of the country that increasingly priced these men out of the market was New York City, where real estate values were skyrocketing – and still are! Officials had an idea to help everyone affected by rising housing costs: rent controls. While the goal was to make units more affordable, the city made the situation worse by introducing temporary relief. Like economist Milton Friedman once quipped, “There is nothing more permanent than a temporary government program.” This relic of 1947 is still around today, exacerbating the housing affordability crisis. It is estimated that approximately 50,000 apartments and one million rent-stabilized units are controlled by a 70-year-old law. To understand how egregious this policy is, look no further than former Rep. Charles Rangel (D-NY). The Wall Street Journal reported in September 2008 that he occupied “four rent-stabilized apartments in a posh New York City building,” living in three and using another as an office. By holding four properties, he took advantage of valuable resources at below-market prices at the expense of others. Is there a difference between bombs and rent control? Economists often pose this question when debating the efficacy of government controls. The Mises Institute’s Joseph Salerno delivered a lecture a few years ago, showing pictures of urban areas and asking his audience if these dilapidated units were the victims of a bombing campaign or rent controls. When you even pose the question, you know it’s necessary to second-guess the prescription. Any time officials use “controls,” you know the policy is going to be a failure. Whether it is preceded by “price” or “rent,” this economically defiant measure produces destitution, deterioration, and destruction. It’s too bad politicians and bureaucrats never learn their lesson.